The sound of thumping basketballs and sneakers squeaking on the court echoed off the walls of the Mattituck High School gym. Basketball is back, but Tiana Baker isn’t. The Mattituck Tuckers have undergone a major face-lift. Not only do they no longer have the graduated Shannon Dwyer, but their other all-conference player from last season, Baker, is gone, too. The sophomore shooting guard, one of Suffolk County’s rising talents, has transferred to St. Anthony’s High School. Talk about taking a punch in the gut. Courtney Murphy seems to have a knack for being in the right place at the right time when she is on the soccer field. That was surely the case on Monday when the Mattituck left midfielder toe poked in the game-winning goal for a 2-1 overtime triumph over Bishop McGann-Mercy. GARRET MEADE PHOTO | Courtney Murphy, who is recovering from a sprained left ankle, shot on the side during Monday’s practice. While her Mattituck teammates drilled and scrimmaged on the basketball court during Monday’s practice, Courtney Murphy was off to the side, doing her own thing. As it is, Murphy is hampered by a left ankle that is sprained in two places. She sustained the injuries while playing soccer this fall. Murphy is anxious to hit the court at full strength and compete for a starting position. Last season she was one of the first players off the bench along with Molly Kowalski. The Tuckers return six players from last season’s 11-8 playoff team. Another six players are new to the team. 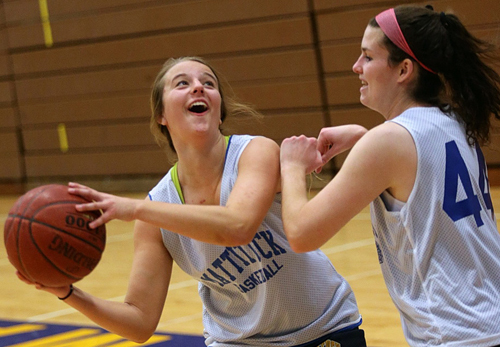 Shannon Dwyer, a senior forward, and Katie Hoeg, a sophomore point guard, are the only returning starters. That being the case, there are positions to be won, and the competition is expected to be tight. And by that, he meant inexperienced at the high school varsity level. They are not new to basketball. Mattituck had the third-ranked offense in Suffolk County last season when it averaged about 54 points per game. What the Tuckers lost in height they have gained in speed. They are athletic and quick, which is why they will turn up the speed this season. That means steals, pressing defense and transition basketball. A new rule change requiring teams to advance the ball over the mid-court line in 10 seconds suits the Tuckers just fine. Speaking of excitement, Dwyer is an exciting player to watch. Last season she was 14th in the county in scoring average with about 14 points per game. Sam Perino can shoot from the outside while Murphy and Kowalski provide an inside presence. Tiana Baker, who was the junior varsity team’s leading scorer last season, may also be a key figure in the offense. The Tuckers, however, took a hit with the graduation of Allie Wilcenski, their top rebounder. It wasn’t all that long ago when Kowalski was one of the newcomers on the team. Now she is one of the veterans.